Our featured client this month is Mr. Scott Himmel — a Chicago-based interior architect and designer, owner of Truex American Furniture, Flusser customer since the early 1980s, and personal friend of Alan’s for over 20 years. My interest in tailored clothing was originally sparked 38 years ago on New Years Eve, when my wife and I got engaged and she taught me her favorite thing to do after midnight: watch old Fred Astaire/Ginger Rogers movies, as she’d done as a young girl with her father. I was mesmerized by how Astaire moved, and how beautifully he wore his clothes. I believe his motto was “wear a dinner suit like pajamas and pajamas like a dinner suit” or something like that. Over the years my tastes have become less pure and more eclectic; I’d say I have one foot firmly planted in history, with everything else facing forward. What was the reason you initially came to Alan Flusser Custom? What is the Flusser style to you? Around 1980, soon after discovering Astaire, I saw an article in a men’s magazine titled “Why I Wear What I Wear,” featuring Alan. There he was, sitting on the floor, legs akimbo, in a classic wide pinstripe double-breasted suit, white shirt with a pinned club collar, a silver wedding tie, yellow hand-framed argyle socks, and black Eton velvet slippers. It hit me just like Astaire had. He was totally self-aware and yet completely comfortable. I bought his books, followed him by patronizing all the great older men’s stores in Europe, and learned by copying his style until it became my own. I actually met Alan a few years later at Anderson and Sheppard, where we were both clients. I had learned to order my A&S suits as he did, with no padding or haircloth in the chest. Alan was always ready to dispense all kinds of useful sartorial advice, and we got to be friends. 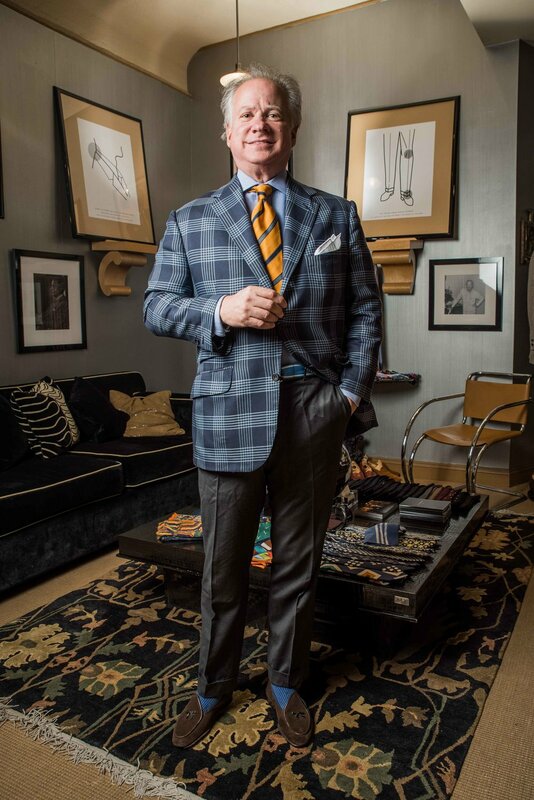 I became a regular buyer of his furnishings at Bergdorf Goodman — a wonderful hose, classic ties, beautiful sportswear — and after I abandoned A&S (they had gone from reasonable to incredibly expensive), I went to Alan, who was by then at Saks, and became a full custom client. I still have and wear everything I’ve ever commissioned from him — some of it well over 20 years old! My two biggest heroes in life are Alan Swain and Thomas Keller. Swain was the first and most important person to publish books on how to play jazz. I was lucky enough to have him as a teacher, and you can walk into any jazz club in the world and find someone who learned to play from his books. Keller — the owner and chef at The French Laundry, has an approach to food based not only on classic French and Italian cuisine, but also informed by the American foods we all enjoyed growing up, and prepared with the latest avant garde techniques. As a result, his food is incredibly fresh and contemporary, but firmly in touch with the past. Alan Flusser’s approach to both sartorial education and design are exactly like these two other masters, and that’s at the root of both my 40 years as a customer and our 20 years as friends. He is a teacher and an inspiration. I actually think there is no professional importance as an architect and designer in wearing custom tailored clothing. It’s purely a personal choice, and one I hope conveys my comfort with myself and my appreciation for the extra effort it takes to look as “effortless” as a Fred Astaire or an Alan Flusser or a Jonathan Sigmon. During the week, I always begin with a suit jacket or odd jacket. Pants may be matching, or classically contrasting — gray flannels for example — or counterintuitive, such as jeans or Alan’s favorite athletic pants from Adidas or Puma. Usually I wear a dress shirt, often but not always with a tie, and whatever classic shoe catches my eye that day, from 30-year-old bespoke reverse calf blucher, to red drivers from Gianni Agnelli’s maker, to a Gucci bamboo bit slip-on, to a Belgian slipper. At night or on weekends, I tend to wear athletic trainers — maybe an odd pair of Stubbs & Wootton slippers — with a cotton and cashmere pullover or polo from Uniqlo, and a truly ancient silk and cashmere print scarf from Hilditch and Key in Paris. My daughters find my “weekend kits” highly amusing, but they’re sublimely comfortable, and not from the numbing mass of indistinguishable clothing available at most stores these days. I am an avid student of all my avocations, from jazz piano to cooking to what I have done for 40 years in my design practice. To do any of these tasks well takes constant study and practice, and dressing well is no different. I try to put out my work day clothing the night before, so I don’t have to think about it in the inevitable morning rush of getting out the door with all of the things I am working on rattling around in my head. Being from Chicago, the ever-changing weather is always a big factor. Occasionally a day will specifically call for wearing something conservative and dressy or casual and rugged, but those days are few and far between. What are your thoughts on the state of menswear today? With the internet connecting the entire world, there are more great menswear options available than ever before. Unfortunately, most men don’t really care … which is fine. How one dresses is a purely personal choice. If you are truly interested in dressing well, learn a little bit of history on how clothing came to be designed the way it is, understand the proportions of your own body and visage, and put in the time in to figure out who you are. The clothing will naturally follow. As an architect and designer, are there any universal principles of aesthetics and design that you apply to both your work and your wardrobe? I am curious about the past, the present and the future. I like the fact that most of my work cannot easily be dated, and I feel the same way about my clothing. Special thanks to Mr. Scott Himmel for participating, and our photographer Mr. Dennis Cahlo.